Some recent comments on various message boards frequented by shooters indicate that a few people are either changing their minds or are bowing to the politically correct pressure of the day. They have begun to assert that they do NOT “love their guns” and only view them as necessary tools. While I couldn’t agree more that guns are simply tools, pretty much like any others, I don’t know why that would make them unlovable. Most men love their tools, all different kinds, and men have always loved their guns. I’m certainly not ashamed to join those men. But, you might ask, just what is it that we (who still profess it anyway) actually love about guns? Aren’t they killing machines, good only for harming others? We hear that a lot. So, why do I love my guns? Let me count the ways. To start with, about 30 years ago I was attacked and would likely have died if I had not been armed. How would the world be better and more peaceful if I had been raped and murdered instead, simply because I had no gun? The old H&R .410 is the gun I used to save my life. 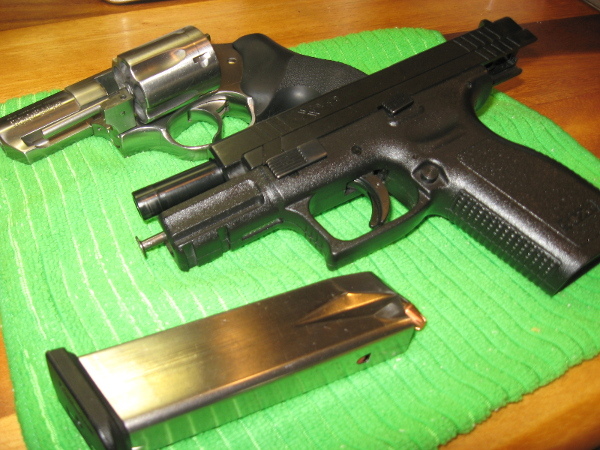 I love to take my guns apart and clean them, usually after a satisfying day at the range or out on the wide grasslands. I love their mechanical simplicity and elegance, the engineering miracle that really has not changed much for hundreds of years. I love the smell of the cleaning products and the silky sound of the action when it is oiled properly. The crisp “snap” of the trigger release is music to my ears. Though I protect my hearing religiously, I love the sound of gunfire on the range when I’m there, and in the distance as others shoot. I’m about a mile from the range and can hear it often. It is the sound of freedom to me – other men and women both enjoying themselves and practicing a useful skill. I have an old M1 .30 carbine. The scratches and dents in the old wooden stock have a serious story to tell… though sadly I can’t read it and the man who could is probably long gone by now. I love to shoot that gun, and imagine the story it might tell if it could. It’s a good old gun, and would certainly help me to defend myself and my neighbors if necessary. My ’52 Marlin 30-30 lever gun is just about perfect for hunting, which could keep me alive if things ever got to that point. That might mean bringing down deer for food, or holding off predators who would take my food away from me. The scarred old stock has another and just as beautiful tale to tell, of hunts and shooting matches and the companionship that both can bring to all kinds of people. A Springfield X D compact 9mm has proven to be the perfect carry gun for me. I carry it proudly, visible for all to admire – or take warning that this 70 year old lady is not going to be a helpless victim. I’m not able to run or fight meaningfully with my bare hands. The gun in that holster gives me the power to overcome my physical shortcomings and equalizes my opportunity to save myself or others from aggression and great harm or death. That is a heavy responsibility and one that most armed people take very seriously. The Ruger .357 magnum revolver is the one I carry concealed, when that seems wise. It was my very first carry gun, and I enjoy shooting it. The most important reason I love my guns is something quite different, however. They represent self ownership, and true independence. They mark me as one who is responsible for myself and willing to risk everything to protect myself and others. It marks me as a free human being and not a slave. Slaves are not “allowed” to own and carry guns. Free people can’t be stopped from doing so. I love my guns, and the liberty for which they stand. 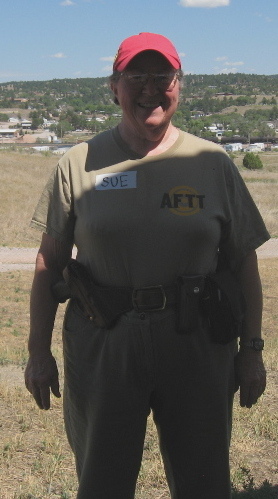 ****** *NRA Certified instructor, with other certification for handguns, self defense. Thirty years teaching and shooting experience. “I Am Not A Victim” is a small book I wrote several years ago about self defense. The first chapter is the story of the man I had to shoot to save my life. Read the story and then send an email to claim your free e-book. Keep on keeping on and Never surrender your liberties . Thank you! This is one of my favorite articles.